PRINCE EDWARD ISLAND leaped into world prominence in tragic circumstances not long after Ross passed it by. It was the innocent means thereby of retarding a revolutionary experiment in globular navigation. Since it had been accepted that the globe was round, mathematicians had pointed out that the shortest distance along its surface, joining any two points thereon, was along a line shaped as an arc. Measuring with a length of cotton, for instance, from a spot on the lower half of an orange to a spot at the same height on the opposite side, more cotton would be required to follow a horizontal line round the side of the orange than one under the lower end of the orange. Endeavouring to apply this principle practically to ocean navigation, a mathematically-minded gentleman named J. T. Towson, who made no profession of being a navigator, with the backing of the Admiralty, published in the late 1840s a set of tables for the guidance of seamen desiring to use the principle. The "Great Circle Principle", as it had come to be called, established that, though Cape Town and Sydney, N.S.W., to take an instance, are on practically the same parallel of latitude, the shortest distance between them was not along that parallel, as suggested by the "flat world" maps on Mercator's projection that we are used to, but along a wide, regular arc that passes quite close to the South Pole. "Great Circle" courses between all points in the Southern Hemisphere would similarly have a southward curve of varying degree, according to their relative positions. the polar regions. His tables were therefore designed to guide mariners in laying down a modified Great Circle course (in other words, taking out some of the curve) where necessary. An intrepid English mariner, Captain Godfrey by name, was the first to make full use of Towson's tables on a passage from England to Australia with his emigrant ship, the Constance. He caused a sensation by making a quicker passage than any other ship had done before. It was mainly due, he said, to his having followed a modified Great Circle course or, as some mariners termed it, "composite sailing". Another English shipmaster, Captain Samuel Potter, commander of the emigrant ship, Richard Dart, determined to try to emulate Godfrey's feat by making a non-stop "composite-sailing" passage from the Thames to New Zealand. He sailed from Gravesend on April 5, 1849. The brig had a complement of 63, including 47 passengers, of whom 28 were sappers and miners in charge of a Lieut. Liddell of the Royal Engineers. The other passengers comprised three male civilians, five women and ten children. Godfrey had curved right down south of the three big island groups between South Africa and Australia, travelling as far south as latitude 50 degrees. Potter, to get the greatest benefit from the longer run to New Zealand, should curve even further south, especially as his destination - Auckland - was further south than Australia. dead reckoning supposing himself to be nearly level with the Prince Edward Islands on a latitude 100 miles north of them. Suddenly, at 3.30 on the afternoon of June 19, however, he ran right down on Prince Edward itself. "You will see by the above date that I have not yet reached New Zealand. I have got a tale to tell and scarcely know how to begin. You are already aware that we embarked at Woolwich on the 3rd of April in the Richard Dart (brig), bound to Auckland, New Zealand. We sailed from Gravesend on the 5th of April and had a pleasant and prosperous voyage until the 19th June, on which day, about half-past three, p.m., I heard a cry of 'Breakers ahead!' We had had foggy weather for six days previously and on looking forward I saw breakers close under the bow. We could see no land, it was so thick; and we were running stem on to the shore. quarter was full of our men trying to cut her away, and the quarter-deck crowded with women and children; when another sea struck her in the stern, swept the deck of all that was on it and carried the boat away. Down it went with its living cargo and we never saw more of any of them. Up to this time I was lying with one leg thrown over the boom, the second mate, carpenter, steward, and one of our men were underneath on the back-ropes; when the jib-boom carried away and we were all precipitated into the boiling surf. "When I regained my senses I found myself grasping some sea-weed attached to a rock, and the backwash of the sea drawing my body underneath; but I held on for about half-a-minute, when another tremendous sea struck me and rolled me up like a ball, in behind a large fallen rock. Well, I could see no means of getting out when the vessel turned broadside on to the rocks and the mainmast went; and I could see some men walking on the top (of the mainmast). They waved to me to come to them; so I watched the rollers coming in, and jammed myself in behind a rock and by that means I got along to where they were, when we all managed to get on the top. How we got up God alone knows, because next day, nor at any time afterwards, could any of us go down the same place. "We mustered eleven souls only out of sixty-three, so that fifty-two met a watery grave. By the time we reached the top it was dark, so we laid down on the top of the rocks, all of a lump. It was bitter cold and came on to sleet. One man was naked; the mate had only on a shirt and one stocking, I had on drawers and two pairs of trousers and my jacket. I gave the mate one of my trousers. The names of those who were saved are the Captain of the brig, Samuel Potter; the mate, John Mills; Edward Pirnie, John Campbell, Richard Collins, and Thomas Jenkins, seamen; one apprentice, named William Jones; and four of us Sappers, Owen Deviney, William Goldsmith, Thomas Inglis, and James Read. "It was a bitter night however, it had an end. In the morning eight were barefoot. Now commenced our sufferings. The Captain told us that it was one of Prince Edward's Islands. He was right. The island was desolate; we looked around us and could see no signs of vegetation - nothing but black rocks thrown up by volcanic eruptions. Of course, the first we did was look and see if others were cast up, but we could see no vestige of the wreck, and only two dead bodies, which we could not reach. We then proceeded to look for fresh water and found a small green plat, with some water near it. We fixed upon this place as a temporary residence; and then went down to the beach, farther to the southward where we went ashore and picked up a few blankets and bits of wood of the wreck with which and sods we built a small hut, which sheltered us from the bitter cold wind. "We remained at this place for seven days to see what we could pick up on the beach; but all we got was a few sperm candles and some more blankets. No provisions of any kind could we get, but some young albatross birds which we killed. But we could not eat them till forced by hunger. On the third day, we eat some of them; the candles also we relished very much. on, and came, about twelve o'clock, to a beach - the only thing like a beach that we had seen since coming ashore. There were four large monsters lying basking in the sun. We were frightened to go near them; however, we did have a try at them, and found they were sea-elephants. We killed two of them, but made no use of them. We resolved to wait at this place for a few days, until we got round a bit; so we set about trying to build. "We were on a place called 'Double Beach' now, but we could find no means of shelter from the night air, but simply rolling ourselves up in our blankets and going to sleep. There was plenty of these young albatrosses round about. So after stopping two or three days there the Captain, mate, two of the sailors and I started to go back to the wreck to see the other two. One of them, Goldsmith, was much worse; his toes were beginning to rot off; the other one, Deviney, was getting round, but not able to walk much. We remained with them three days and started on the first of July to our old place on 'Double Beach' after leaving them six birds - a good week's provisions. of that we could not walk for about a week. Our feet were dead, and our fingers had no feeling in them for a long time. "We remained there until the 26th July, on which day Edward Pirnie and Thomas Inglis discovered a small hut, about three miles from this cave with a number of men's names cut out in wood, that had been there at different times; the latest was four names, and at the bottom was carved (on a journey round the island) '27th May'; they reported this news to us ; and so it was decided that the Captain, Pirnie, Inglis and I should travel right round the island until we came back to the same place, to see whether anyone was on the island. "We started on the morning of the 27th July, and reached the hut early; we there decided, as it was blowing and snowing, that we would wait a day or two for it to moderate before starting, as there were some awful mountains to go over. In the meantime we had a good rest and consulted a bit, when we decided that one should stop at this place in case the men should come there while we were away. I volunteered to remain by myself till I got relieved some way or another. On the morning of the 30th, the Captain, Pirnie and Inglis started from the hut, full of hope. I remained alone; it was a beautiful sunshiny day, so I took out what blankets there were, aired them and had an excellent wash in a stream. I also found half a stick of tobacco when clearing the hut out; and in the evening committed myself to the care of that Gracious God who had preserved us all amidst so many dangers and trials, and slept comfortably, more so than I had done for many a long night. Next day, about midday the mate, John Mills, and Jones, the apprentice, came to where I was; so that at this time, on the 31st July, there were three on the search, three at the hut, two at the cave and two of the sailors along with Goldsmith at the wreck. and I were going to jump up to have breakfast, a knock comes to the door. 'Open the door!' says a rough voice. Says I, 'Jump up, Mills, we are saved at last!' He opened the door and there stood two strangers with a small bag on their backs ; one a Scotchman, the other an Englishman; they immediately struck a light with a tinder box and made a fire, gave us a pipe and tobacco, and commenced cooking some farina. From them we learned that the Captain and the other two had been seen the night previous by them and taken to their cave; that there were twelve men on the island belonging to Mr. John Jearey of Cape Town, Cape of Good Hope, employed by him in killing sea-elephants and frying oil out of them; that they had been four months out of bread, coffee, etc., had filled all their casks with oil and had nothing to live on but some farina which has been on the island for years. Of course they invited us, and told us, as long as it lasted, we were all welcome. The Courier was a Cape Town schooner that was making her routine call at the islands for seal oil and furs when she found the brig's survivors. The news she brought of the disaster caused a profound sensation in the maritime world. Cape Town's "Shipping and Commercial Gazette" devoted columns to a description of the wreck, introducing its story with the comment "This lamentable event has excited such great and painful interest, that we have taken pains to procure as full and accurate an account as possible." The newspaper's account was certainly full, and interpolated such details as a description of how the first roller "swept into eternity 47 unfortunates, who, a few minutes previously, had been in good health and spirits, looking forward with hope, anticipating no evil". After relating how Lieut. Liddell had been swept away, along with the woman passenger whom he was struggling to free from under some fallen spars, the reporter felt it in order here to insert the opinion that "in all probability, had he taken refuge in the main rigging, he would have been saved to the service, of which he promised to be an ornament ..."
The account went on to state that the Richard Dart's commander supposed himself at the time of the accident to be in lat. 44 50 S., long. 36 40 E., but: "We believe Prince Edward's Island is not correctly laid down on the charts, for the masters of several vessels in the employment of Mr. Jearey make the north side of Prince Edward's Island to be in lat. 46 05 S. and long. 37 07 E. We cannot vouch for the correctness of this position, but we have no doubt that it is much safer and better to keep on the parallel recommended by Captain Erskine, R.N., say 38 degrees or 39 degrees, than further to the southward, and to avoid so high a latitude as 45 degrees or 46 degrees." The reporter "earnestly recommended to the attentive perusal of commanders of vessels" an article published in the paper's last number, "containing sound and judicious observations" as to the best parallel of latitude on which to run down the easting. After the Richard Dart disaster it was a long time before shipmasters again allowed mathematicians to influence them to follow courses that were against their better judgment. small and ill-found. It is even said that some intrepid (or foolhardy) fishermen and sealers sailed all the way from Mauritius and Reunion to the southern island groups in open boats. Certainly men from the Indian Ocean islands were frequent visitors to the three groups down in the south. 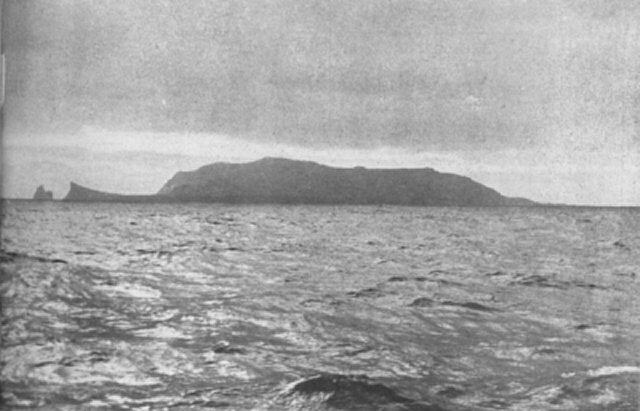 Even on her way back to Cape Town with the Richard Dart survivors, the Courier fell in on the night of September 12, some distance east of the Prince Edwards, with a vessel bottom up. The master of the American whaler United States reported to the Courier that on the same day he had passed two wrecks also a little to the east of the Prince Edwards, but that it had been blowing too strongly for him to examine them. Mr. John Jearey, the Cape Town shipowner whose sealers had helped the survivors of the Richard Dart, lost one of his own ships on Prince Edward Island a few years later. She was the bark Maria, and she left Cape Town in May, 1857, under the command of a Captain Hamilton, to fetch sea-elephant oil and skins, and to transfer seven of Mr. Jearey's men who had been collecting these on Prince Edward for the previous two years to the Crozets. great difficulty. By now the Maria was breaking up rapidly, and Captain Hamilton abandoned hope of salving anything, diverting his energies to making a way of escape for himself and the remainder of his men. They eventually managed to get a line to their companions on the shore, and making their end of it fast to the mainmast they were dragged, one by one, to the beach. By noon there was not a vestige left of the Maria. The 28 castaways were in a sorry plight, without food, exhausted, wet through and shivering from cold, and without shelter. To add to their misery it was snowing heavily and drizzling. During the day they found on the beach a little water-soaked biscuit, which they ate. Next day, from the wreckage of their vessel, some began to build a hut, while the rest sought sea-fowls for food. They brought back about six dozen "night-hawks." At first they found their flesh very nauseous, with a fishy and disagreeable flavour. In time, however, they got used to the taste and ate with relish. During all the months they spent on the island the only food they had was the flesh of wild birds, shell-fish and, in fine weather, a little fish caught in pools among the rocks. Some got very ill through the food they ate. answered their signals. The surf was too heavy to allow them to be taken off, but the Flora remained in the vicinity till it qujetened sufficiently, two days later, for her boats to go in. She brought them safely back to Cape Town on January 12, 1858. The "Cape Argus", reporting that they had lost everything that they possessed, and asking its readers to assist them in their plight, commented: "The Captain informs us that this is the first time he ever went to sea without insuring his effects."